Last year I tried growing watermelon, and I failed miserably. 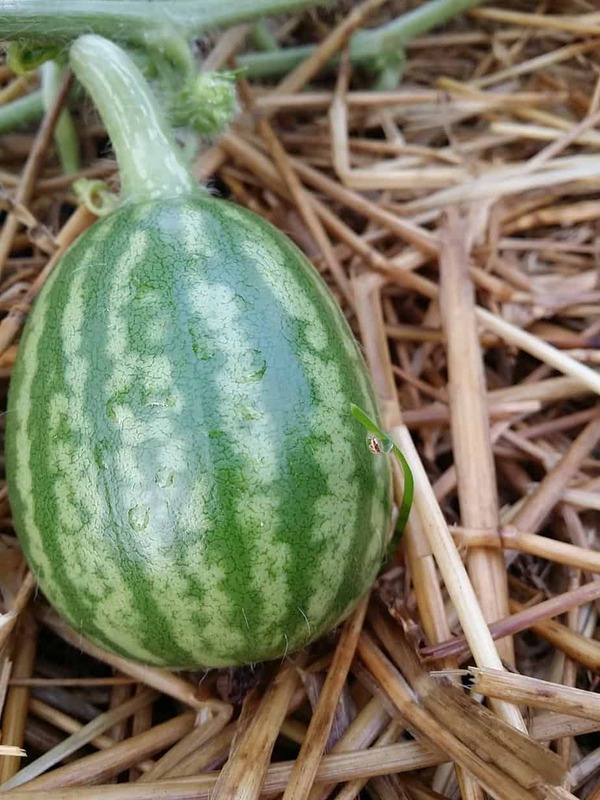 Let’s take a look at the only proof of watermelon seed that I have from last year. That unfortunately turned into nothing. It wasn’t pollinated, and we spent the rest of the summer looking at a beautiful vining plant, but reaping none of the benefits of actually eating that red, sweet flesh that so encompasses what summer means to so many. However, there is hope beloveds! 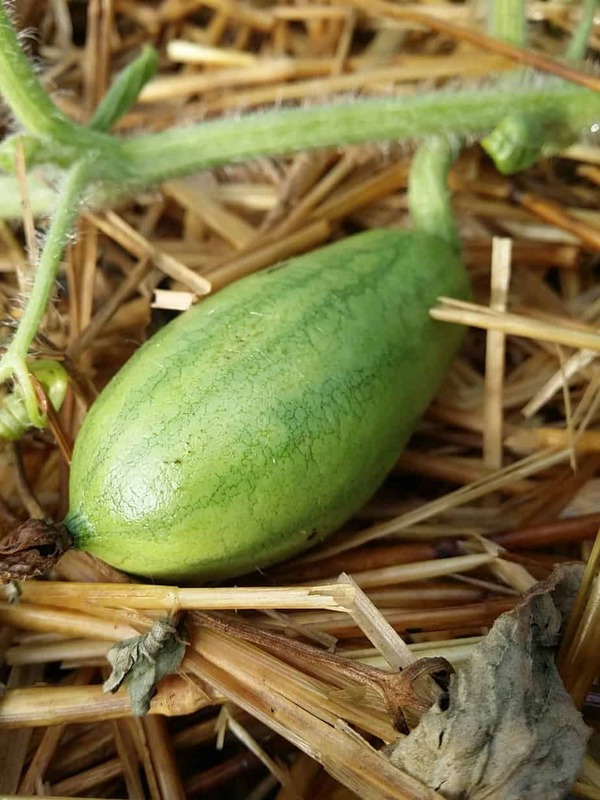 I learned from my mistakes last summer, and I planted watermelon in enough space where it could sprawl AND be pollinated by bees and butterflies, and flies (yuck) and even ants. 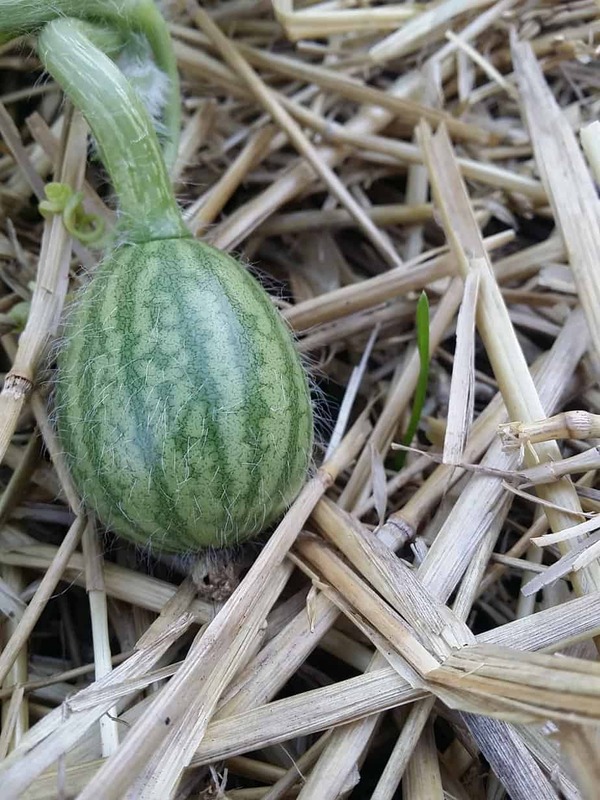 I am happy to say that not only are we growing watermelon, but we are growing watermelon(S), and I’m hoping we will be able to take a couple to Mr. Houseful’s family reunion next month! Here is what I came back home to after almost a week in Santa Fe, New Mexico for Type A Parent Conference. It was so beautiful to me, and such a sweet sight, because of how badly we failed last year. How did I know that it was pollinated? Because it was big. You see, cucurbit plants (melons, squash, and cucumbers) show the ovary (vegetable and fruit) of the plant long before it’s pollinated. So you may THINK you’re going to be enjoying one of those things soon, but you may be sorely mistaken. I usually hand pollinate just to make myself happy, and it works. I’ll write more about that next week. Then, two days later, I took this photo of the same watermelon, and not only had it lost most of its fuzz, it had grown three times larger. The markings are darker, and it’s just amazing. This is as much a lesson for me as it is for those of you who may be in the same boat that I was last year. Try again next year. Adjust your spacing, pay attention daily. It’s a lot like what one should do when they are focused on a goal, right? I promise this won’t turn into a reflection of sorts. I just wanted to add something pretty to your day this morning. Because, these days, we need as much of it as possible. I leave you with my first Congo Watermelon too. This is rumored to get to about 40 pounds, but I think we’ll cut her off at 10 or 15! Your watermelons look amazing! I just planted watermelons for the first time this year and I am hoping they flourish like yours did! Thank you for the great pictures and high hopes that they will be amazing! !